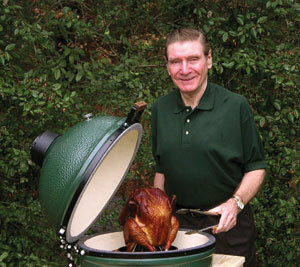 Here's the history of Big Green Egg throughout civilization! In the beginning there was wood, dry leaves, lightning and eventually, fire. Early man soon learned about the flavor benefits of cooking meat over this exciting discovery, which quickly gained acclaim as far superior to gnawing on raw Tyrannosaurus ribs! Eventually, specialties such as smoked brie and s’mores were added to their culinary repertoire! Later cultures discovered that the results were even better when the fire and food were contained inside a dome-shaped, earthen vessel. 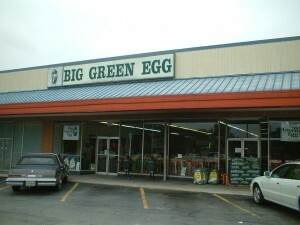 Evidence of these early prototypes of the Big Green Egg have been found by archeologists in the ruins of nearly every civilization around the world … except the Propanians, who preferred to scorch their meals using volcanic gasses, and the DriveThruians, who ate all their meals from take-out and quickly vanished from planet earth. Centuries ago, these knee-high cookers were fueled by wood or natural charcoal (just like the Big Green Egg is today), and pots were hung inside them for cooking rice. Eventually a slatted cooking grid was fitted inside for grilling and roasting meats, and by the 1600s they were raised off the floor and placed on a platform – a position which undoubtedly was much easier on the cook’s back! Popularity spread as U.S. servicemen discovered this type of cooker during World War II and shipped them home after the war. The domed cookers were an exciting alternative to the metal charcoal or gas grills of the day, and people became enamored with the added flavor and juiciness this “newly discovered” style of cooking gave to foods. As the EGG gained popularity, the company aligned with a state-of-the-art factory to manufacture its products in the hands of skilled ceramic artisans. Company engineers incorporated new types of ceramics, based on materials initially developed by NASA for the space program, and worked tirelessly to find ways to improve the design. The result was a far superior cooker that is stronger, more durable and provides better heat insulation than anything else on the market, a distinction the Big Green Egg is known for today. As the Big Green Egg has evolved over recent years, significant changes have been made to keep it miles ahead of other “kamado” cookers. State-of-the-Art ceramics and a patented draft door and vent cap deliver a wide range of easily adjusted cooking temperatures from high-heat searing to low-and-slow smoking. A hard-coat porcelain glaze ensures the signature green color will not fade or discolor under harsh outdoor conditions. Other improvements which have enhanced the traditional design include an easy opening hinge assembly and a durable stainless steel cooking grid. Never content, a team of R&D specialists keeps looking for ways to make the Big Green Egg even better! From the original Big Green Egg, the company has grown to include seven sizes of the EGG available throughout the world in over fifty countries, with hundreds of accessories designed to make cooking anything on a Big Green Egg fun, entertaining and delicious!